I’d like to share a little about the heroine in All About That Kiss, which will be the next book released in my bestselling Kissed by the Bay series. 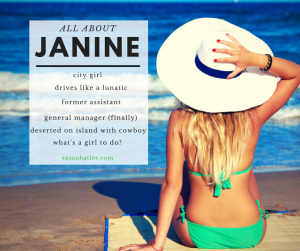 Janine Wilson, a city girl, vows to only date men who share the same interests as her because she had nothing in common with her ex. But she can’t find a connection with any guy she meets. Then her ex, Cody, takes her to a deserted island, which he claims will be beneficial to her work. Reluctantly, Janine agrees to the boat trip and is surprised to find Cody’s best friend, Jackson Davis, at the helm. “But I’ve never felt that connection. Not once in my life.” I shook my head, wondering why I was unloading on Jackson when he was my ex’s best friend? And where had Cody disappeared to? I needed to get back to my project at the Inn and off this deserted island, which didn’t even have Internet. Shudder. A line formed between Jackson’s brows as if he didn’t believe me. Was he challenging my desperation? I felt the sudden need to prove my point about being dead inside. So, without thinking, I pressed my mouth to his and closed my eyes. Fireworks exploded in my belly as my mouth claimed his. I sagged against him, which was a very good thing because the moment his mouth responded to mine my legs went liquid. Then he deepened the kiss by parting my lips with his tongue and I tasted him. Shivers danced up and down my spine. Zing-zing-zing! Oh, wow. So not dead inside. Our tongues moved together in sync, but I felt unable to get enough of him, of Jackson. A small sound escaped me as I leaned closer, my hands pressed against his solid chest as my whole world spun. Sparks? More like a raging inferno. I hope you liked this sneak peek from Janine’s story, All About That Kiss. In celebration of my upcoming release, I’d like to give away two autographed paperbacks of Every Little Kiss (US only; e-book if out of country). To enter to win this giveaway, please comment below with 1) your favorite thing about the Kissed by the Bay series; and 2) your favorite book of mine and why. Good luck with the giveaway and happy reading!! 1) From what I have read of the sneak peak I feel the books are well written. 2) I don’t have a favorite yet as I am just starting to read some of your books. I am excited to get to read them. Hi there! It’s Laurel, and no my name does not sound like Yanny ;). I love how your series Kissed By The Bay are real and the characters actually show how they deal with every obstacle rather than glossing over the hard parts and focusing on true love. My favorite still happens to be Every Little Kiss because it relates to my relationship and how everything started with just luck, passion, and a guy who decided to stay around just a bit longer to see what may be. I haven’t read any books in the Kissed by the Bay series, but most of them are patiently waiting for me on my Kindle. I’ve only read Driven to Date but I absolutely loved it. Great romantic tension, character growth and swoon-worthy kisses. It was positively adorable and incredibly entertaining. I can’t wait to reread this one and read more titles by you. Thanks for the giveaway. The series is tantalizing and has the Bay water as an important setting. I can see, hear and feel the land surrounded by water in the Bay. It’s a sparkling series that ends with HEA.